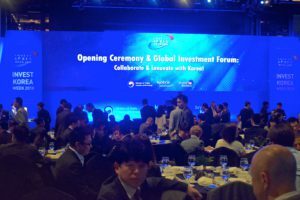 On November 6th, ‘Global Investment Forum’ was held on Grand Intercontinental Seoul Parnas. 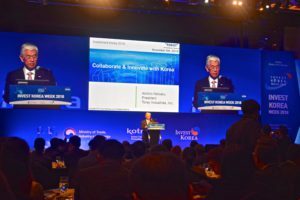 As part of ‘Invest Korea Week 2018’, it was hosted by the Ministry of Trade, Industry and Energy (MOTIE), and the Korea Trade-Investment Promotion Agency (KOTRA). Speakers of this day introduced various information particularly about investment environment in Korea, technology trends, business strategies, cases and more. Specifically, the speakers that were invited were from Invest Korea, Toray Industries, Monsoon Blockchain Storage, Korean Smart Cities Special Commission under the Presidential Committee of 4th Industrial Revolution, Samsung Electronics, Hyundai Motor Group, and MEMC Korea. This day, attendees including foreign investors were able to earn valuable information about investment and business opportunities in Korea. It was also a chance to get together with investors, entrepreneurs and other participants to share ideas and exchange information. ‘Invest Korea Week’ kept going on successfully for the rest of the week. Some of the main programs that took place include International EV forum, Foreign investment press forum, business partnering and job fair. If you are a foreign investor or are interested in these types of events, do not miss the next ‘Invest Korea Week’. We suggest you to keep track of our ESCCK news and visit the KOTRA or MOTIE website for more information.